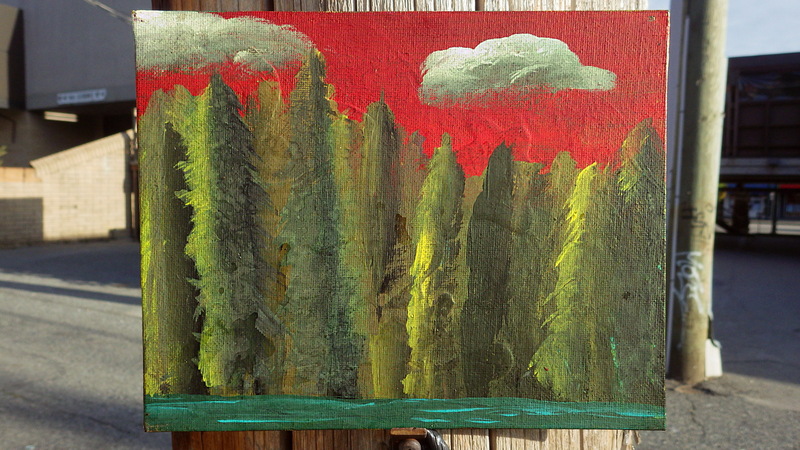 Small painting from the alleys showing a conifer forest against a red sky. The smokey haze over Vancouver the last two weeks may be gone—washed away by overnight rain between August the 12th and 13th—but this week I came across another reminder of the wildfires burning in British Columbia’s Central Interior. On Tuesday (August 15), in a Fairview back alley, I found a small, abandoned painting depicting, in thick strokes, a forest of conifer trees set against an ominous red sky. There aren’t any flames visible in the red sky—only two doughty little clouds—so I can’t claim that the painter of this oil-on-canvas-board was trying to illustrate a wildfire. All I can speak to is what I see, which is an impasto sky painted red by the glow from a wall of flame advancing on even more of our trees! As of August 16th, The 2017 B.C. wildfire season officially become the most destructive since record keeping began in 1950, according to new reports. Between April 1st and August 16th, B.C. wildfires burned 894,491 hectares, beating the 59-year-old record set in 1958 of 855,000 hectares burned. To put the number in some perspective, 894,491 hectares equals over a quarter (28.6 percent) of Vancouver Island (3,125,800 hectares) and covers an area three times larger than the Metro Vancouver Regional District (MVRD), which takes up some 288,268 hectares and contains the City of Vancouver, Burnaby, Richmond, Surrey and 19 other regional districts, large and small. This wildfire season, as of August 16th, the government of B.C. has reportedly spent $315.7 million fighting forest fires across the province. The price tag for firefighting is perhaps the easiest to calculate but the costs to society of such a destructive wildfire season are many and can variously be measured in terms of money, human effort, social dislocation, suffering and in quite a few other ways as well—some of which are not so obvious, or easy to work out. Back on July 7th of 2015, for example, at a time when wildfires had burned over 200,000 hectares of B.C. forest, I tried calculating the amount of sequestered CO2 that burning so many trees could release into the atmosphere. I arrived at a ballpark number of 22,145,500 metric tonnes of carbon dioxide—enough to equal the total annual C02 emissions of 4,711,808 typical passenger vehicles! That’s a lot of CO2 and a lot of cars. In fact it’s about 63 percent more than the 2.9 million motor vehicles ICBC reported in all of B.C. in 2014! It was so many cars, in fact, that I shelved the post, on account of I didn’t trust my numbers. At the time I could find very little solid information on the public Internet relating to the release of sequestered carbon through forest fires and I ended up relying on disputable data. I’ve since found reference to a 2007 study by the U.S. National Center for Atmospheric Research (NCAR) and the University of California that likewise shows sudden, enormous, CO2 releases are a predictable cost of large wildfires, so I may dust off and publish my 2015 post—dodgy numbers and all—just so people can argue the point, if nothing else. August 1—when woodsmoke invaded the skies over Vancouver—the B.C. Wildfire service reported 117 active wildfires burning in the province. On August 15th the reported number was up to 132 and today (August 17) it is 125—down some but still an increase over the beginning of August. So, while the light rain of four days ago cleared the skies over Vancouver and gave us back our view of the North Shore Mountains, there’s no telling how long before haze envelops us again. For one thing, the wildfire that likely gave us the haze at the beginning of the month—the 200 hectare blaze located some 50 km to the northeast of the city, at Harrison Lake East—is still burning. And for another thing, some of the smokey haze that was washed out of the skies over the city actually still lingers at street level, invisible except at night, when it can be seen diffusing the glare of approaching automobile headlights, just before they crest a hill. Bring on the PNE and the rain! Evenings are getting perceptibly cooler now in Vancouver; summer is winding down. The season’s traditional closing finale, the Pacific National Exposition (PNE), opens two days from now, on Saturday, August 19th, and runs until September 4th. The PNE—for those of you unacquainted with this 107-year-old Vancouver tradition—brings with it many pleasures, guilty and otherwise, such as vertigo-inducing fairground rides, deep-fried, sugary junk foods, cute, furry farm animals you can pet, live bands that you remember from when you were a kid, nightly fireworks and—if history is any guide—the first real rains of autumn. In fact, given the PNE’s reputation as both a fun time and a reliable rainmaker, I think that organizers would have done better to have skipped out on Vancouver altogether this year and just trucked the whole exposition—mini Donuts, Superdogs and all—up to B.C.’s Central Interior. Residents in the Cariboo region, in particular, have been in wildfire fight or flight mode now for well over two wearying months; I’m sure they could do with a little amusement and a whole lot of rain. Click the images to enlarge them. From → Art, British Columbia, Discarded paintings, Lower Mainland, rain, Trees, Vancouver B.C.